While writing a CV might be a difficult task, judging one can often be even tougher. As an employer, judging the quality of the CVs you receive is one of the most important aspects of the recruitment process. It will determine the quality of candidates you interview – and, ultimately, of the people you hire. So what are the tell-tale signatures of a great CV? A good CV will be targeted specifically to the job for which the candidate is applying. Many candidates simply print off dozens of copies of exactly the same document and send them to a range of employers, without considering what each specific employer might actually be interested in. A good candidate, however, will tailor the CV to the position – rather than mass-mailing a pro forma document. If the candidate hasn’t taken the time to check their CV for spelling and grammar mistakes before sending it, they may well adopt the same lackadaisical approach to their work. A good CV will be free of these mistakes, and will read well. It will make you want to read on, rather than appearing simply like a list. Does it include a covering letter? A good CV will always come with a covering letter, particularly if it is unsolicited. The letter should be personable, and should act as an introduction to the candidate rather than simply rehashing the information that is contained in the CV. In an ideal world, the CV should explain why the individual is qualified for the position, while the covering letter should persuade you that you want to work with them. Is it in a suitable format? A great CV will be written in a format suitable for the position for which the candidate is applying. CVs are most commonly written in one of two formats: chronological, or skills-based. While chronological CVs are seen most frequently, they may not be the best choice for the position you are trying to fill. 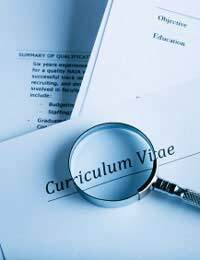 A good CV will consider the nature of the position carefully, and choose a format accordingly. Does it concentrate on your needs? Many CVs concentrate mainly on the candidate themselves, explaining why the position is right for them. It should, of course, be the other way around; the document should explain why the candidate can fulfil your needs as an employer. It should set out exactly what they can do for you, rather than what you can do for their career. Does it have suitable references? References are absolutely vital, and yet very few employers bother with them. A CV without readily available references should always set alarm bells ringing. It is vital, though, that you check those references. A huge proportion of employers simply take candidates’ word for it when it comes to references. This is not enough; you need to check them thoroughly yourself. Identifying the best CVs in a pile of dozens can be a tricky task. But it is also an important one. Once you learn to pick out the best CVs, you will help to ensure that you hire the best people.